With the increased popularity of social media, hashtags have started to make their way into marketers’ ads and marketing strategies. Today, hashtags are so much more than a button you can find on your phone. They are a vital part of customer engagement on social media. Today, business create a hashtag to help customers have a better experience, get more information, give their customers a feeling of fellowship and like they’re a part of the brand. Whether the hashtag is a branded term, your slogan, or a call to action, they help make people engaged. Hashtags let people join the discussion that circulates around a brand and engage with it. The evolution of hashtags upon to this day is very clear, and their importance in marketing has never been as big – with even the world’s biggest companies using them in their marketing. In the ads back in the days, it was phone numbers, then it moved to websites until finally landing on what we have today – social media handles and hashtags. Hashtags have a lot of benefits for your business. First and foremost, they let customers engage with brands in a more personal way that lets them feel like they are part of a movement. Not only are hashtags good for getting the conversation going, they are also tremendous tools for marketing campaigns, and there are a bunch of case studies that prove this. We’ll go more into detail of successful hashtag campaigns further on, to further understand what made them successful. Hashtags are also tremendous tools for including a call to action and making your audience associate your brand with that hashtag. The end goal with a personalized hashtag is to get your audience to start using it, leading to a trend, which ultimately gives your brand a ton of exposure. Almost every brand who takes social media seriously, and have a strong social presence implements one or more personalized hashtags in their marketing. This gives them a ton of exposure which will help them grow quicker, and it also gives them customer-generated content that they can use in the future. 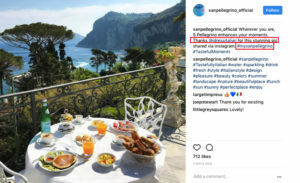 San Pellegrino uses two hashtags in their social media marketing. 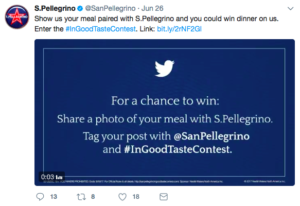 The first hashtag is #InGoodTaste which encourages their customers to share images of their food accompanied by San Pellegrino. To further encourage people to use their hashtag, they run a giveaway with the rules of entry being using their hashtag. This is a very simple and clever method that is used by many brands to get more traction to their hashtag and to spread awareness about it. The second hashtag San Pellegrino uses is #MyPellegrino. This hashtag is broader than the tag mentioned above and asks people to share photos of their San Pellegrino bottles and experiences. This time, they are not running a giveaway to get people to use their hashtag. Instead, they are sharing some of their favorite photos that people have posted using that hashtag. Since re-posting content is a way for you to show your appreciation, people will continue to use the tag in the hopes of getting their content seen by you – and hopefully also re-posted. You now know the “why” of using hashtags on social media, so let’s move on to the “when“. General hashtags should be used on all your posts on social media – except those platforms where it is not beneficial. 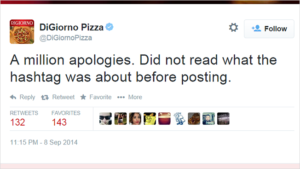 However, personalized hashtags are something else – and should be treated accordingly. Different hashtags have different purposes, and as we’ve touched upon briefly, there are more broad personalized hashtags, and there are less broad hashtags. What do I want the hashtag to do? How will the hashtag help me do it? Obviously, the goal with using a personalized/branded hashtag is to get your audience in on the fun and to join the discussion. There’s no point as a brand to stand and shout your message without having anyone listen to it. We’ve spoken about the fact that hashtags are powerful to help you get your audience engaged, but there are much more to it than that, and many more benefits of using one. This is the big one. By now, you should know that hashtags, in general, help you reach more people and make it easier for people to find you. Well, so does personalized hashtags – just not in the exact same way. Before your hashtags get any traction and people start using it, not a lot of people will visit it, this limiting your exposure. However, once people start using it, personalized brands are much more effective than regular hashtags. If you see someone using the regular hashtags such as #summer, #sun, #happy etc. how often do you click on them to see other posts made with that hashtag? Personalized hashtags are something unique, and something that people don’t know what they are. Who knows what might be hiding around the corner? Shortly summarized, personalized hashtags spark an interest at a much higher level than regular hashtags do, resulting in more people checking it out. For example, one of Estée Lauder‘s social media hashtags is “Esteestories“. When seeing it, you are intrigued to find out what those stories are. If you click on it, you’ll see all kinds of different Estée lauder stories. One thing leads to another, and hashtags help you do a lot of things. It’s very clear that hashtags help you get more exposure for your brand, and as a result of that exposure, more people find you. When more people find you, and inevitably, you’ll get more engagement, more followers, and better overall results on social media. As you are getting more exposure, a natural part of it is getting more traffic. With more traffic, you also have the chance of making conversions right away as well. Hashtags are an incredible tool for social listening, and by analyzing the posts generated with that hashtags, you can learn quite a bit about your audience. According to a study by Sprout Social, 90 percent of surveyed consumers have used social media to connect with a brand. What’s more, 34.5 percent said they preferred social media above traditional outreach channels like phone or email. This just goes to show how important customer service on social media is, and also shows that social listening isn’t something that shouldn’t be neglected. That’s not all… If you can encourage your audience to use your hashtag, the last mentioned statistic will rise significantly, as your personalized hashtag will be a natural way for people to connect with your brand. No matter if you receive complaints or praises through the hashtag, it is vital that you respond to them, and collect the information you get in order to address any issues that many of your customers might be facing. What’s great about personalized hashtags is that you can use them across social platforms. No matter if you are using social platforms where hashtags are popular, or platforms where almost no one is using them, you can implement them into your social marketing strategy. Since the main purpose of using branded hashtags as a customer isn’t to get the maximum amount of reach, instead, it’s about getting seen by the brand and to join the conversation – it works! The creation of a hashtag is very simple. All you need to do is use the fence symbol (#) and then add your keyword right after it. For example, if my hashtag is Veloce International, I would write #VeloceInternational. However, the real challenge is what hashtag you choose to create, because this will have a big impact on how it performs, and how people react to it. We spoke about what hashtag you choose should reflect your objectives with it – and that’s completely true. Does any of these match your goal? There are two general types of hashtags you should use. First off, we have the short-term hashtag. This is used only to promote a particular event or something that only run over a short period of time. The most common occasions for this type of hashtag is product launches, events, and contests. 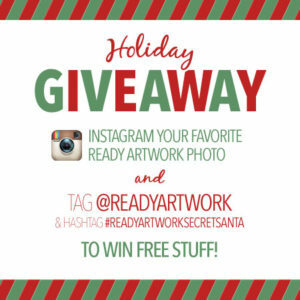 Ready Art Work created a hashtag relevant only when their giveaway was on. The purpose of the short-term hashtags is to shed light on whatever is happening during that period of time, however, there is no point for people to continue using it once the thing you wanted to promote is over. Short-term hashtags are particularly common during giveaways. 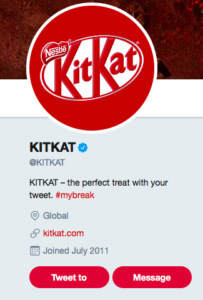 Brands often create and use a giveaway-related hashtag as the rule of entering the content, which also helps encourage other people to join it. You’ve probably guessed it by now, but the second hashtag type is the long-term hashtag. Opposite from the short-term hashtag, this is relevant all year round and not dependant on a particular season, event or product. Long-term hashtags are often created with evergreen keywords or terms such as your brand name in hashtag format, your motto, or slogan. Nike‘s “Just do it” slogan is a hashtag that really never goes out of style or relevance. Once again, which of these two you choose depends on your goal with the hashtag. You don’t want to create a hashtag that is too difficult to write. The longer your hashtag is, the more chances are that people will misspell your hashtag, leading to you never being able to see it. Also, if your hashtag is too long, it might discourage some people from using it, thus leading to fewer interactions and less engagement. The only exception to writing a long hashtag would be if it is a well-known word or term that people are likely to know how it spells, thus minimizing the risk of misspellings. For example, when looking at the hashtag “Louis Vuitton“, you can see that a lot of people have misspelled it and written “Loui Vuitton instead”, thus preventing them from joining the conversation. On Instagram only, over 20K people have made this mistake. Of course, if you believe that you can have success by using a long hashtag, don’t let me stop you from doing so. A memorable and catchy hashtag always tend to do better. Not only will they not forget about your hashtag, they’ll also start associating it with your brand. Some of the world’s largest companies are brands who have successfully built a slogan that everyone knows. 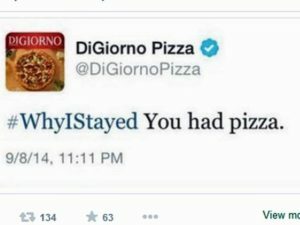 Of course, the reason to the slogans becoming so famous isn’t thanks to hashtags, however, these brands can now implement these well-known slogans into their hashtag marketing seamlessly. Recognize any of these slogans? So does millions of people – leading to a huge leverage for these companies when it comes to implementing them on social media. 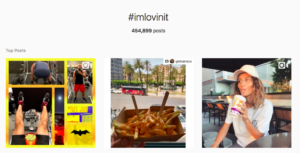 In fact, Mcdonald’s slogan “I’m lovin’ it” has generated 464,899 posts on Instagram. -That’s quite a lot of exposure for the brand! Make sure your hashtag is unique. If the hashtag you use is really broad, there might be a chance that your hashtag already is used by a lot of people. When deciding on a hashtag, you want it to be previously unused. Also, make sure that you check this across platforms, so you know your hashtag is unique across all platforms. If you create a hashtag that is an actionable hashtag, you tend to engage more people. A well-known example is Nike’s “Just do it”. The slogan is one that can be used in many types of situations – not only when using your products. Plus, the hashtag explains and shows what Nike as a brand is all about which also encourages their audience to share their personal stories with the tag. Before you decide on a hashtag, you have to carefully control its meaning, and during what circumstances it has been used. If you are to use a hashtag that has been used for something completely different than you intended, it can end up backlashing, and instead hurt your brand. 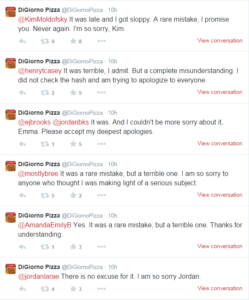 DiGiorno pizza made an embarrassing hashtag mistake on Twitter as a result of not checking up the meaning – and if people had used it previously, before posting. The “WhyIStayed” hashtag is used by women on social-media explaining why they chose to live with the person who physically abused them, so of course, it’s not strange that this tweet stirred up some emotions. Unless you want to eat up for your hashtag mistakes, make sure you research the history of it very, very carefully before using it. You’ve created a hashtag for your brand. But the only one who is using your hashtag is you and a few loyal supporters – if you’re lucky. If you aren’t seeing any traction, thankfully, there are several approaches you can take. Use one or a few of these and you can be sure to get people to start using your hashtag. Since your personalized hashtag will do most of the work on social media, and that’s also where you are looking to get people to use it, including your hashtag in your social media bios across the platforms is a must. Simply include the hashtags you wish to get more traction on, and if you’d like, you can also add a call to action that encourages people to use it. 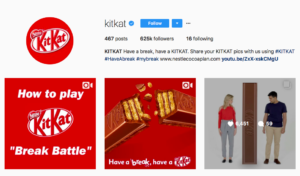 KitKat writes “Share your KitKat pics with us using #KITKAT #HAVEABREAK “MYBREAK” in their Instagram bio. In their Twitter profile, they are also promoting a hashtag they wish their audience to use. Giveaways are great for promoting hashtags, and that’s why a lot of brands are implementing hashtags into their giveaways. The best way to get the conversation going is to, as mentioned earlier, make the rule of entry to simply share a pic using your hashtag. A bit more effort-consuming task, yet still a method that gets people going and engaged. If you sell products, find unique and fun ways to incorporate hashtags on your packaging or on your products. 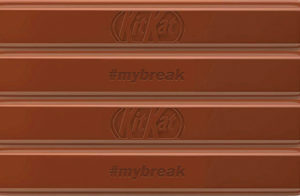 Once again, KitKat shows that they are masters in starting conversations around their brand with hashtags. Coca-Cola has also incorporated hashtags on their products several times. 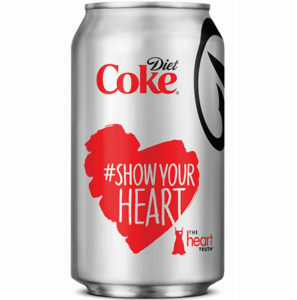 One example is when they promoted the “Show your heart” campaign. If you are running ads, why not implement your hashtag there? Since your hashtag gets exposure, you can get people to start thinking about your hashtag early in the conversion funnel. 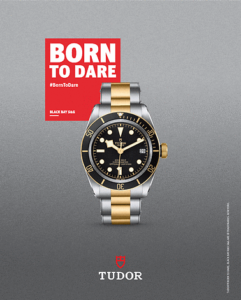 Tudor watches includes their “BornToDare” slogan in almost all of their ads in order to get the conversation going. Sometimes, you don’t need to overcomplicate things. If you want people to use your hashtag, why now ask for it! Make a post on social media using your hashtag, then asking your audience to share their images with that tag as well. Also, if you don’t want to ask your audience to use your hashtag in every single post of yours, you can add it at the end of each of your social posts to further give the tag visibility. 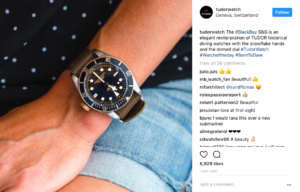 Tudor also adds their “BornToDare” hashtag in the end of all their social posts and have found great success with their hashtag campaign. A personalized hashtag is one of the most effective ways to getting your audience engaged, thus helping you get more exposure on social media. Carefully select a hashtag relevant for your business, that people will remember and use, then implement the tips presented above on how you start getting traction for your tag, then watch the results start rolling in.